My husband and I began showing and breeding dogs in 1974. Our family has a love and passion for animals that is deeply rooted in our lives. Our children and grand children have the same passion. Our 15 year old granddaughter has been involved in rodeos since she was 3. She rodeos now on a professional level. Our grandson who is 5 will be starting to rodeo soon. Through the years we have had some memorable wins. Our most resent win being the first award of merit at the 2008 American Shih Tzu National held in Atlanta, Georgia. shown in the Best Of Breed competition. He was only 18 months old. Over the years our Shih Tzu has been rated in the top 10 nation wide. We are a member of the American Shih Tzu Club. Our puppies are raised in our home not in concrete runs. We DO NOT breed our females every season. We raise 3 or less Shih Tzu litters a year. This allows us to give the puppies the love and attention they need. we love and our responsibility for building this future. Most breeders and show fancy recognition our dogs by the look they have. We have had numerous people comment that I knew it was a Dee-Jay's Shih Tzu without asking. Our Shih Tzu have a beautiful head and gorgeous face. They stand out where ever they go. 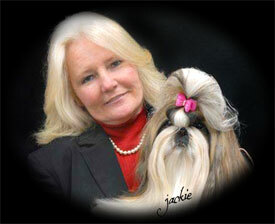 Our passion for our Shih Tzu is evident in the way our dogs are bred, cared for and raised. Our vision not only dictates how we breed but also why we breed. The American Shih Tzu Club. whether group winners, champions, or just affectionate companions.